The Standard Model of particle physics (SM) has been very successful at describing the elementary particles and the forces that bind them together. However, the Standard Model presents some significant problems for big bang theorists. This is because the SM does not contain any Dark-Matter particles, and the neutrinos in it are described as exactly massless. Which means that in its present form, it is in clear contradiction with the big bang model as required by various observations. Those observations have led to the need to include Dark Matter in the standard (ΛCDM1) big bang model, particularly during the period of nucleosynthesis, just after the big bang beginning when the light elements were allegedly formed from hot hydrogen. Therefore, the Standard Model of particle physics is in stark disagreement with the requirements necessary for the formation of the first elements in the alleged big bang. Where are the Dark-Matter particles? In addition, billions of dollars have been and are currently being spent on laboratory searches for these new hoped-for particles, in particle accelerator labs like CERN and Fermilab. We have read about the $10 billion dollar search for the Higgs boson at CERN, which was apparently successful.4 However it has caused another headache for the big bang origin of the universe and the speculation called ‘inflation’. If found though, these new Dark-Matter particles would then change the necessary conditions in the modelling of the very early big bang universe, at the time of the formation of the light elements such as deuterium (D), helium (He), and lithium (Li), according to the theorised BBN processes. The supposed Dark-Matter particles are exotic forms of matter that are really invisible because they do not interact with normal matter or radiation, or are extremely weakly coupled. Their presence has only been inferred by their postulated effect on gravitation. For example, galaxy rotation curves—anomalously high rotation speeds of the gases and stars in the outer regions of spiral galaxies—are explained by the presence of this postulated, unseen Dark Matter in a spherical halo around the galaxy. According to theory, soon after the beginning of time itself, from the hot big bang ‘fireball’, eventually a plasma formed that comprised essentially protons and electrons, which were subsequently smashed together to form neutrons and subsequently the protons and neutrons were fused to form the light elements.5 See Fig. 1. Figure 1: Formation of deuterium (1 proton and 1 neutron) Credit: Ethan Siegel, modified from Lawrence Berkeley Labs. Baryons are the normal matter particles, mostly protons and neutrons, which comprise most of the known matter in the universe. But the anti-particles (anti-protons and anti-electrons) must have also formed, with the condensation of those normal matter particles.6 However they are not observed. The lack of observations of the anti-particles in the known visible universe is another serious problem for the big bang. The anti-matter should be present in equal amounts to the normal matter in the universe. But it is not. This is sometimes called the matter/anti-matter asymmetry, or the baryon asymmetry problem. It has become a tuning parameter in the big bang model.7 That means the theorists do not have a theoretical model that can predict what the asymmetry is, or should be, nor how it allegedly came about. How do the cosmologists expect to resolve these dilemmas? According to the standard big bang model, at the time of BBN, the universe was opaque to radiation, which means radiation was in equilibrium with the surrounding plasma; it would be absorbed as fast as it was released from the very hot fast-moving particles. If the radiation is continually absorbed before it travels any distance, it follows that one cannot directly observe that epoch using conventional telescopes of any description, radio through optical.8 But, it is believed that by measuring the abundances of the light elements one can accurately reconstruct what was happening during the BBN epoch and hence resolve these problems. Of course this presupposes that BBN is essentially correct and it now is only a research problem to solve these contradictions. Then by making observations of the deuterium abundance in the distant, hence early, universe, it is believed that this will resolve the issues. This follows from the assumption that deuterium could have only formed in the super hot plasma of the big bang. Then by adding to the theory sufficient Dark-Matter particles, with the right properties that give you the observed concentration of deuterium, one then says that one has detected the invisible Dark-Matter particles. That is how the ‘logic’ works here. Now the baryon asymmetry (i.e., there is far more matter than antimatter) is used as the only free parameter, which is then determined by application of the model to observational data from the cosmic microwave background (CMB), and from the supposed primordial abundances of the light elements (hydrogen (H), helium (He), deuterium (D), lithium (Li)). It is the practice to determine the ratios of these elements with hydrogen, e.g. D/H. The observationally determined D/H values are scattered over a range of about an order of magnitude—meaning their measured values are different by about a factor of 10. Until it can be better measured there is no precise figure for this ratio, nor is its value consistent in different directions in the cosmos. It is believed that by more precisely determining these parameters (light element ratios, particularly D/H) cosmologists will be able to find which theoretical Dark-Matter particles fit observations, and excluding those that don’t. See Fig. 2 for the theoretical X/H dependence on evolution of the universe. X in this case represents the light element expressed as a ratio with hydrogen. Figure 2: The alleged evolution of the light elements in the early universe. Density of Ordinary Matter is a proxy for time because, according to the theory, as the universe expands that density essentially decreases. The vertical red bar indicates the limit that the WMAP CMB observations can ‘see’. Are you starting to comprehend yet the elephant in the living room? The Standard Model of particle physics applied to BBN does not work unless you add new unseen particles—Dark Matter. These are needed to resolve several problems, particularly the baryon asymmetry. The reality is that the SM is the best theory ever developed by modern physics in its very successful predictive power and ability to explain the atomic and sub-atomic world. There is really no need to include any exotic Dark-Matter particles unless you look at this hypothetical big bang nucleosynthesis.9 In other words, the need for Dark Matter to be added to the SM is largely motivated by cosmology. The Dark-Matter particles are given exactly the right properties (which no particles known to man have) to keep the big bang paradigm alive. Note, I am not against positing the existence of a new particle in physics and then doing experiments to look for it. The problem here is the motivation; the big bang history is assumed for the universe, contrary to what Scripture says, and hence we must make BBN fit with the Standard Model of particle physics, resulting in the need to ‘invent’ exotic Dark-Matter particles. Homogeneity and isotropy means that the distribution of matter in the universe on the largest scale is essentially uniform and the same in every direction, as seen by any observer anywhere in the universe, at the same epoch of time. This is an assumption that is essential in solving Einstein’s field equations for the equations of motion for the standard big bang model that are tested against observational data. This means homogeneity and isotropy are basic assumptions of the standard big bang model. Independent measurements of the believed expansion of the universe in different directions11 from the best high-redshift supernova data found that to fit the data properly a 43±0.06 % disparity of total matter content, based on the overall average fraction of total matter (about 26% where 22% is Dark Matter), was needed in opposite directions in the cosmos, aligned with a preferred direction for the accelerating expansion. This means that if you use observational data in one direction you need the universe to be comprised of 15% Dark Matter (assuming 4% normal matter) to get big bang theory to fit that data. But if you do the same in the opposite direction you need the universe to be comprised of 26% Dark Matter (assuming 4% normal matter) to get theory to fit that data. That represents a 43% disparity in Dark Matter content. That is hardly consistent with uniform expansion. That is, there is a 99% probability that the universe has a preferred direction—a special axis—and it is detected by independent methods.13 That makes it neither homogeneous nor isotropic. Another team found14 large bulk flows of distant astrophysical objects reveal relative velocities much larger than predicted by the standard model, and in contradiction with it when tested against measurement data from the CMB, suggesting that the universe is not homogeneous. Now there exists a discrepancy between the actual measured abundance of lithium in the distant universe and that predicted by BBN. Lithium is both produced and destroyed in stars, so it is difficult for big bang theorists to derive its expected primordial abundance. Whereas it is claimed that deuterium has no known post-BBN production mechanisms, and hence it is easier to ‘predict’ its expected abundance. Note: this is not really a prediction because the abundances of the light elements, e.g. D/H, are measured and the models are tuned accordingly. It has been called a ‘post-diction’ by some. 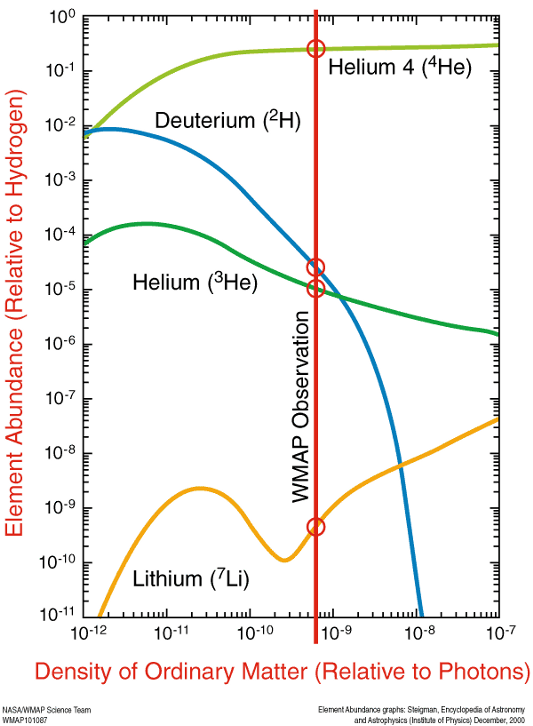 In particular there is a significant discrepancy for the abundance of lithium-7 derived from BBN theory with that determined from the CMB data measured with the Wilkinson Microwave Anisotropy Probe (WMAP),19 and the abundance derived from Population II stars.20 The discrepancy ranges by a factor of 2.4–4.3 below the theoretically ‘predicted’ value, and hence is a problem for the big bang models. See Fig 2. A range of theoretical models are offered to explain the apparent lithium-7 deficiency, and one of the latest offers an ‘axion’ to facilitate cooling of photons in BBN. An axion is the name for one of the putative Dark-Matter candidate particles, which has been sought after for more than 40 years in laboratory experiments. Introduce a new particle and it changes many parameters, which then change the outcome of the big bang nucleosynthesis process determined by theoretical modelling. So naturally if it adjusts the elemental abundances one would get in the observed universe, then why not measure them and use them to tune the model? From this then you determine indirectly the existence of new Dark-Matter particles, even though you cannot observe them, nor detect them in a lab experiment. Instead, the universe becomes your laboratory. But from this you cannot say the evidence is incontrovertible because you cannot interact with the universe. You are limited by what you receive in your telescopes. And computer simulations are not the same things as testing a model of the real thing, because of the problem of cosmic variance. This means that the same observations could be explained by alternate causes, and to be sure you were right you would have to eliminate all of those. It seems to me that, outside of some new revealed information directly from the Creator, which will probably have to wait until Jesus returns, big bang nucleosynthesis is the unbelievers’ attempt to explain the observed universe without God. Because, if you could explain everything about this universe just with the laws of physics then you could feel more justified in saying that ‘this is all there is’. Of course, this is the definition of materialism—which is assumed a priori. But note what this worldview leads to, the invention of new particles (axions, sterile neutrinos and other forms of Dark Matter), and new forms of energy (Dark Energy that drives the supposed acceleration of the expansion of the universe). None of these are found in laboratory experiments. Yet this is not a small correction, but these new forms allegedly comprise as much as 96% of the mass-energy content of the universe. This is so bizarre, it is hard to believe that anyone believes it—such is the commitment to materialism. As it stands now, though, the most successful theory known to physics, the Standard Model of particle physics, contains no Dark-Matter particles, but big bang cosmology demands them. Therefore, because of this prior commitment to materialism, the Standard Model ‘must’ be changed, else it will remain a stark reminder of the failure of the standard big bang model. Λ represents Dark Energy and CDM represents Cold Dark Matter. Nucleosynthesis refers to the generation of new atomic nuclei from particles such as neutrons and protons. BBN refers to the belief that certain nuclei formed in the early stages of the supposed big bang. The ‘patches’ to the so-called perfect model of Aristotle resulted from the fact that the planets in our solar system have elliptical and not circular orbits. The Nobel Prize in Physics 2013 was awarded jointly to François Englert and Peter W. Higgs “for the theoretical discovery of a mechanism that contributes to our understanding of the origin of mass of subatomic particles, and which recently was confirmed through the discovery of the predicted fundamental particle, by the ATLAS and CMS experiments at CERN’s Large Hadron Collider.” To balance that in 2011, the Noble prize was awarded for the discovery of the accelerating expansion of the universe. I don’t place cosmology into the same realm as experimental laboratory physics. I would say you can believe the Higgs boson has been discovered much more so than any claim in cosmology. Smash an electron into a proton and you get a neutron. From these 3 particles you can build the rest of the light elements. Actually other light subatomic particles (mesons and leptons etc) are also involved but this is essentially the story. In a putative earlier period the plasma initially comprised only electron/anti-electron pairs and neutrinos. See Hartnett, J.G., A Missing neutrino – Dark radiation, Answers Research Journal 7:357–361, 2014. Scientific language meaning in this universe we only observe normal matter, very little anti-matter. Where is the missing anti-matter? So the theory is accommodated with a secondary hypothesis to avoid rejecting it. This would be fine if such stuff existed, but it is added to the theory only because of the worldview framework. The primary theory is never questioned. Because neutrinos are believed to have formed first with the initial electron/anti-electron plasma about 1 s after the big bang when the neutrinos decoupled from their plasma, in theory one could use the Cosmic Neutrino Background (CNB) to probe that era of the early BB universe. But neutrinos are extremely difficult to detect and the CNB has not yet been detected. Having said that it has been proposed that the solar neutrino deficit, the atmospheric neutrino anomaly and the Liquid Scintillation Neutrino Detector experiment (1993-1998) excess of events would be better explained with an additional (flavour of) neutrino—the sterile neutrino. There are currently only three flavours known but if there was at least one more, a sterile neutrino, neutrino oscillations between active and the proposed sterile neutrinos could have a significant effect on the R process in type II supernovae. See Aguilar, A., et al., Evidence for Neutrino Oscillations from the Observation of Electron Anti-neutrinos in a Muon Anti-Neutrino Beam, Phys. Rev. D 64:112007, 2001; http://arxiv.org/pdf/hep-ex/0104049v3.pdf. See Ref. 6 paper on the sterile neutrino. Antoniou, I. and Perivolaropoulos, L., Searching for a cosmological preferred axis: Union2 data analysis and comparison with other probes, Journal of Cosmology and Astroparticle Physics 12, 12, 2010. This is the problem of cosmic variance. We have only one universe and to determine if something is statistically significance one must run computer simulations to see what a typical universe might look like. But we actually don’t know what one should look like. See The largest structure in the observable universe, or cosmic variance? By combining the axes detected using various methods one gets the most probable single axis (or preferred direction). See discussion on fine structure constant in Is there any evidence for a change in c? Nothing sinister is suggested in that. Cosmologists are simply operating within their worldview. A spaceborne telescope which measured CMB anisotropy data—small variations or noise in the intensity and polarization of the radiation from the cosmos. Stars found in galactic halos and globular clusters. They have low concentrations of heavier elements (heavier than Li) and are believed to be older stars. Is there definitive evidence for an expanding universe? Does the claimed ‘find’ of dark matter end the ‘big bang’ crisis?